Born in 1430, Marguerite was the daughter of the Duc d'Anjou. She was married at the age of fourteen to England's King Henry VI, as part of a peace treaty between England and France. She wasn't able to get pregnant until 1453 and by the time she gave birth, Henry was so mentally and physically ill that he wasn't even aware of the birth of his son. Marguerite now became much more important in the political arena as she was forced to work with the protectorate of Richard, duke of York. An incapacitated king led to a power vacuum York was only two happy to fill. I don't want to get into the Wars of the Roses, because it's super-complex and would take a much longer blog post to explain! After the deaths of her husband in the Tower and her son on the battlefield, Marguerite spent 1471 to 1476 as a captive of Edward IV (the new king) and was finally released into French custody, where she died six years later, dependent on French King Louis XI, who confiscated most of her lands to compensate for his supposed expenses on her behalf (Diana E. S. Dunn, ‘Margaret (1430–1482)’, Oxford Dictionary of National Biography, Oxford University Press, 2004, http://www.oxforddnb.com/view/article/18049, accessed 6 Oct 2011). So, not a very happy story, but I always loved her name and I think of her every time I see an Anjou pear, so I thought it appropriate to name a cake after her! Besides, I think she needs some love! No, not a happy story, but a very pretty cake! What I would give for a slice of this lovely cake right now! I'm glad Marguerite has a cake named after her. mmm, the cake looks so yummy! 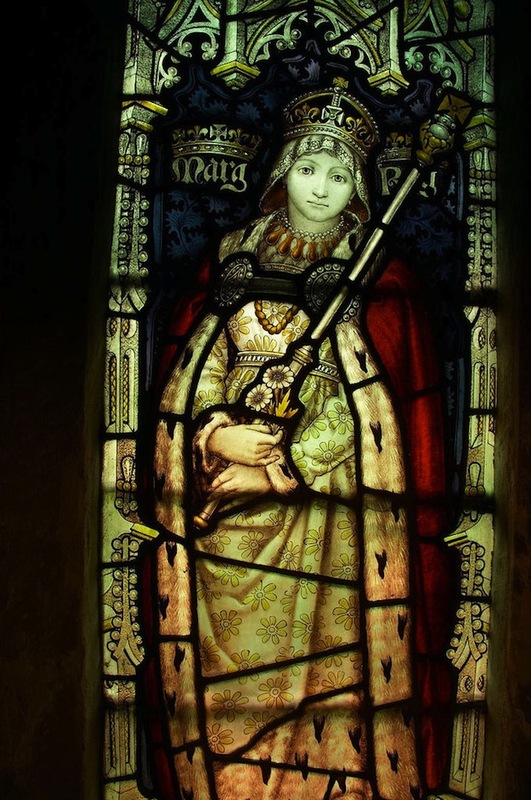 Even her stained glass portrait looks sad. But the cake looks excellent! Last week, I went baking with my friends... and I took an easy recipe from somewhere else. I just realized I TOTALLY should have taken one of your recipes. ...So angry with myself now. I can't bake so working with friends is the only way I can do anything. Send a slice of that cake over here! What a lovely cake, and a sad but interesting story behind the pear's namesake. I actually don't know whether the Anjou pear is named after her or not. I guess it could be named after the region or the dynasty. I just started reading historical fiction at an impressionable age, so Marguerite d'Anjou always stayed with me. I'm sure you'd be able to bake on your own. Just start with something simple and very explanatory. Do you have a Betty Crocker or Better Homes and Gardens? Pear cakes are some of my favorite, and now thanks to your beautifully told story, I'll be thinking about Marguerite each time I see/bake/eat one. Great post, and such a lovely stained glass window too. Her daisy dress is so pretty. Isn't it great how they always gave hints in the stained glass windows or statues about who the person or saint was? Oooh! That looks so yummy! Thank you for the sweet comment. I made this yesterday Lauren and it was utterly divine! My diagonal desk mate at work turned 30 and I made it as a birthday cake. It vanished in about 30 seconds flat and everyone really enjoyed it. I made it wish Nashi Pears - not sure what these are known as in the States. Scrummy. Interesting story that shows it's not always good to be queen. Lovely recipe as well. That's so lovely to hear! I'm blushing! We actually call Nashi Pears "Asian Pears" here. I've never tried one, though, because they're usually so expensive compared to the other varieties. I'll have to try some now!